Technical and scientific aspects of water-from-air machine (atmospheric water generator) operation are introduced and explained for prospective buyers, owners, and users of this equipment. The knowledge in this guide is valuable for making cost-effective decisions about using the freshwater resource the exists in Earth's atmosphere. 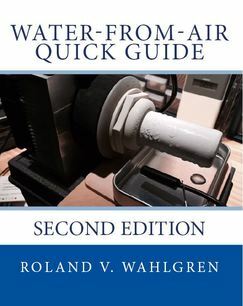 Water-from-Air Quick Guide (Published 2016; 142 pages, paperback). Click on this cover image to go to Amazon (USA) to buy your copy! Click to go to the Amazon (USA) page for this book for details, preview, and to purchase. Roland V. Wahlgren's bio - click here.